Mast cells (MCs), which are granulated tissue-resident cells of hematopoietic lineage, constitute a major sensory arm of the innate immune system. In this review we discuss the evidence supporting the dual role of MCs, both as sentinels for invading pathogens and as regulatory cells throughout the course of acute inflammation, from its initiation to resolution. This versatility is dependent on the ability of MCs to detect pathogens and danger signals and release a unique panel of mediators to promote pathogen-specific clearance mechanisms, such as through cellular recruitment or vascular permeability. It is increasingly understood that MCs also contribute to the regulated contraction of immune activation that occurs within tissues as inflammation resolves. This overarching regulatory control over innate immune processes has made MCs successful targets to purposefully enhance or, alternatively, suppress MC responses in multiple therapeutic contexts. 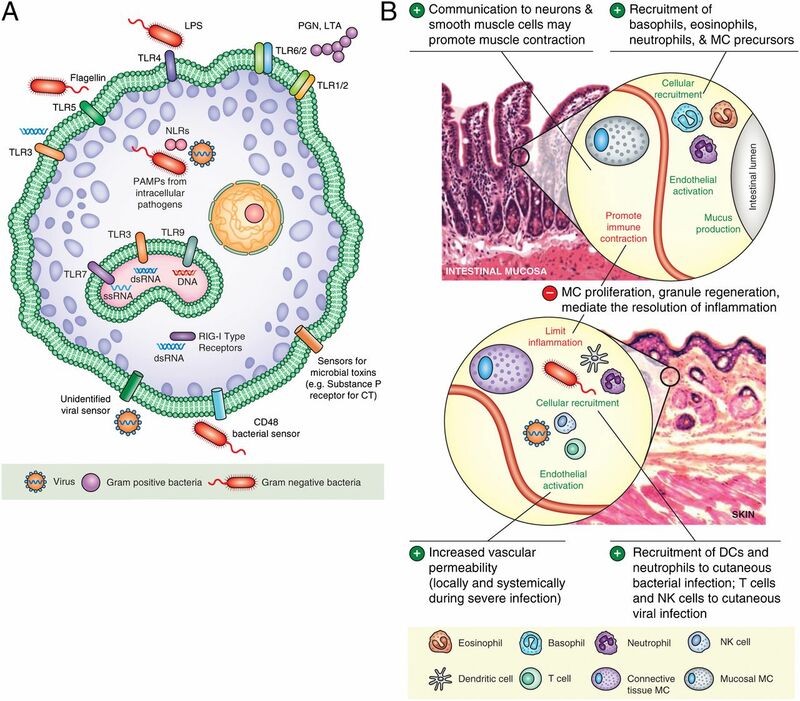 Immediate responses to pathogens are typically initiated in epithelial tissues, such as the skin, intestinal/urogenital epithelium, and nasal mucosa where environmental pathogens are first encountered. Pathogens may also be injected into the circulation by insect vectors or gain access owing to surgery or medical interventions. Immunosurveillance for pathogens relies on a wide array of pattern recognition receptors (PRRs), which are hard-wired to recognize both extra- and intracellular pathogens and pathogen-derived products (1, 2). Most cells express PRRs, although nonimmune cells generally have fewer types of PRRs or other mechanisms to limit unwarranted activation. PRR-initiated signaling induces epithelial, endothelial, or local immune cells, including dendritic cells (DCs), monocytes, and macrophages (Mϕs), to release cytokines and/or antimicrobial agents (e.g., cathelicidin, β-defensins) (3, 4). Additionally, danger signals released from injured or dying cells (e.g., ATP, heat shock proteins, bradykinins, and complement split products) (5, 6) can potentiate signals received through PRRs (7–11). Some responses prompt direct killing of pathogens, such as complement activation, antimicrobial peptides (AMPs), and phagocytosis/degradation by host cells (3, 12). Both uninfected cells that detect pathogen-derived products or infected cells may indirectly initiate the clearance of pathogens through the recruitment of neutrophils, NK cells, and others from the circulation. PRRs can also trigger apoptosis or pyroptosis (13), resulting in the death of infected cells, further facilitating infection clearance. These processes are coordinated to resolve infection and, conversely, to avoid immune pathology. There is growing evidence that mast cells (MCs) are key regulatory cells capable of coordinating and integrating many branches of the innate immune system. MCs act as professional immune sentinels owing to several attributes involving a heightened capacity to detect pathogens, adaptations to promote communication within the tissue and to distant sites, and their prime location as first responders to pathogen colonization. As previously reviewed, the close association of MCs with both epithelial and endothelial barriers strategically places them among the first cells to encounter pathogens (5, 14) along with other innate immune cells on the front lines of infection, including DCs and Mϕs. Initial detection may not be due to direct pathogen exposure, as MCs also sense danger signals emanating from the surrounding tissue, including epithelial, endothelial, and tissue-resident immune cells. Depending on the balance of activating stimuli perceived by MCs, they release a panel of inflammatory mediators with a degree of specialization for the type of pathogen detected. Stimuli such as many whole bacteria, parasite products, and even the structure of certain viruses can induce release of an MC’s cytoplasmic granules (15–17). At a site of infection in vivo, host and pathogen-associated products likely have a combinatorial effect to promote extensive degranulation. Release of vesicle-encased granules into the surrounding tissue as vesicle-free particles usually begins within seconds of exposure to degranulating stimuli. Granules are packed with inflammatory mediators, including heparin, proteases, TNF, histamine, and others. The dense granule structure promotes their travel through lymphatics to draining lymph nodes (DLNs), where they trigger the recruitment and sequestration of APCs and T cells (18). However, extracellular granules contribute to innate immunity, as well, by protecting inflammatory mediators from dilution or degradation and allowing the slow release of associated products (19). In vivo, many particles also remain trapped at the site of activation due to anatomical barriers (18). DCs and Mϕs can phagocytose extracellular MC granules (20), which may be a mechanism of communicating to APCs within the site of infection or DLN. Delayed in comparison with degranulation responses, MCs release de novo–produced inflammatory mediators (e.g., cytokines, chemokines) requiring transcriptional changes with a time course similar to other tissue-resident immune cells such as DCs and Mϕs. However, the MC-produced lipid mediators, eiocosanoids (i.e., leukotrienes and PGs), only require enzymatic events to occur downstream of activating signaling and, therefore, are also produced within minutes of activation (21). As the first tissue-resident immune cells capable of releasing prestored mediators in response to infection, MCs are instrumental in determining the initial inflammatory mediator profile at a site of infection and, therefore, the quality and character of the host response. The balance of signals in the inflammatory milieu is ultimately highly influenced by the initial information gathered by MCs through various receptors for pathogens and their products. MCs express multiple classes of PRRs: TLRs, Nod-like receptors (NLRs), Rig-I family receptors, and others (22–26) (Fig. 1A). Few functional differences have been described between rodent and human MCs, and yet there are differences in TLR expression and cellular distribution. Human MCs express TLR1–TLR9 (22–24), although there have been variations in detection among many studies. TLR stimulation generally produces signaling below the threshold required to generate calcium flux and granule exocytosis, except, potentially, peptidoglycan stimulation through TLR2 (27). TLR-induced signaling in MCs, similar to other cells, results in stimulus-specific transcriptional activation and production of cytokines/chemokines (5) and also attunes other MC responses. For example, pretreatment of MCs with TLR agonists results in sensitization and enhanced degranulation in response to IgE cross-linking through FcεR1 (28). Eiocosinoid pathways are also activated by TLR signaling (29). In some contexts, MCs may be one of the only cells proximal to an infection site capable of detecting certain pathogen-associated motifs. For example, in the lung, MCs express TLR10 and TLR7, which are not abundantly expressed or induced with TLR stimulation by lung epithelial cells (30, 31). The role of TLR10 on MCs has not been described; however, TLR7 agonists induce MC-dependent localized tissue inflammation and adjuvant activity, implying that a similar response may occur to ssRNA during infection (32, 33). Illustrating the potency of TLR7 activation on MCs, the TLR7 agonist imiquimod was recently shown to promote CCL2 production by MCs and, in turn, the recruitment of plasmacytoid DCs that directly killed tumor cells. This response was independent of the adaptive immune system and provides a MC-dependent mechanism of the effectiveness of imiquimod against skin cancers (34). Pathogen recognition and innate immune regulation by MCs. (A) MCs respond to diverse subtypes of pathogens and pathogen-associated motifs due to their expression of PRRs and additional unique cellular receptors. Receptors that are used by MCs, the cellular location of the receptor (cell surface versus endosomal versus cytosolic), and the class of pathogen or pathogen-associated molecular pattern (PAMP) that the receptor recognizes are summarized. (B) Unique events are promoted by MCs in response to different pathogens and based on tissue-specific MC capabilities. The release of MC products can promote cellular recruitment, vascular leakage, and other physical processes that are central to combating pathogens, such as mucus production. Additionally, MCs play a regulatory role in the tissue remodeling and immune contraction processes that must occur subsequent to inflammation to restore homeostasis. The best characterized PRR responses of MCs are those directed toward bacterial products: LPS through TLR4, flagellin through TLR5 (on human MCs), and peptidoglycan through TLR2 (5). MCs also express TLRs for detection of viral products (e.g., TLR3, TLR7, and TLR9). Indeed, TLR3 stimulation by polyribosinic-polyribocytidylic acid results in activation of MCs (24). Both Newcastle virus and dengue virus have been shown to activate MCs to produce cytokines and chemokines, including CCL5, CXCL12, and CX3CL1 (15, 35). For dengue, this response occurred through synergistic activation of the TLR3 and RIG-I pathways, resulting in production of type I IFNs and chemokines (15). However, the signaling pathways that are activated by TLR stimulation may not always benefit the host. In HIV-infected MCs, TLR stimulation augmented viral replication (36). Although the mechanism is not understood, this illustrates that highly host-adapted pathogens can also exploit immune activation by MCs. NLRs recognize cytoplasmic microbial products and have primarily been studied in the context of mucosal MCs (25). NLR activation initiates inflammasomes, intracellular multiprotein oligomers that promote inflammation, caspase cascade activation, and cleavage to the active forms and secretion of cytokines, including IL-1β and IL-18 (37). Inflammasomes are not only implicated in pathogen defense, they have also been associated with some kinds of sterile inflammation. An interesting MC-related example is cryopyrin-associated periodic syndrome, a rare inflammatory disorder linked to certain NLRP3 mutations where individuals have chronic uticaria, a common symptom of MC activation. MCs with NLRP3 mutations have constitutive activation of inflammasomes leading to chronic production of IL-1β, heightened recruitment of neutrophils, and increased vascular leakage in mouse models, in the absence of degranulation (38). Thus, defects in the pathogen recognition signaling circuitry in this powerful immunomodulatory cell can result in inflammatory dysregulation with severe consequences. Beyond traditional PRRs, MCs use other molecules that directly detect pathogens or their products (5). These trigger a variety of responses, some of which are anomalous or suboptimal and may favor pathogen survival. For example, CD48 serves as a receptor for fimbriated Escherichia coli and several other bacterial pathogens (5, 39). CD48 not only induces MC degranulation, but also bacterial uptake without intracellular degradation, creating intracellular bacterial reservoirs (40). MCs express receptors for bacterial-secreted toxins, including Clostridium difficile toxin A, Bordetella pertussis toxin, and cholera toxin. Whereas C. difficile toxin A triggers MCs to provoke hypersecretion in the gut, B. pertussis toxin inhibits MC secretion of most of its cytokines, and cholera toxin elicits MC secretion of a few cytokines but not degranulation (41–43). Thus, pathogen virulence factors also can activate non-PRRs to elicit potentially counteractive responses. The nature and magnitude of MC responses to a given pathogen are likely to be dictated by the cumulative outcome of opposing signals among many pathogen-sensing receptors. Genetically modified mouse models are used to address the functional consequences of MCs in vivo, although each has inherent caveats (recently reviewed in Ref. 44). To date, most of these studies have been performed in mice lacking MCs owing to mutations in the promoter region of the c-kit gene (“sash” mice) and have supported that MCs amplify immunity and enhance the kinetics of an inflammatory response (44). Even without MCs, many immune cells can recognize pathogens in peripheral tissues; however, in certain contexts, the advantage the host receives through the actions of MCs can influence survival during infection (5). MC responses to bacteria are better understood, but limited studies using viruses or parasites have emphasized that MCs modulate the nature and magnitude of innate responses uniquely, depending on the infecting pathogen and infection site. MCs produce a powerful type I IFN response to viruses but not when challenged by bacteria, presumably because IFN-β negatively impacts neutrophil recruitment, a key mode of bacterial clearance (45). At mucosal sites, MC granules have dominant incorporation of the protease tryptase, less histamine, and use the proteoglycan chondroitin sulfate as a scaffold for their mediators, in contrast to connective tissue type MCs, which include tryptase and substantial amounts of chymase on a scaffold of heparin (46). The subsets of human MCs are less well characterized than rodent MCs and do not appear distinguishable as mucosal or connective tissue subtypes as readily, but they also display heterogeneity (46). These differences likely reflect the need for unique strategies to counteract pathogens that colonize different sites (Fig. 1B). Although many immune cell types and factors contribute to parasite clearance from mucosal sites (47), mucus production, which facilitates the physical flushing of pathogens (e.g., Trichella spiralis) from mucosal surfaces, is a key aspect of MC-promoted innate immunity (5). During Nippostrongylus brasillienis infections of the gut, parasite expulsion is linked to increased mucus secretion by goblet cells, which are regulated by MC products such as histamine (48). Histamine-mediated secretion by goblet cells has also been observed in the lungs (49). Although the benefit is not immediately clear, products of mucosal MCs, particularly LTC4 (another secretagog for goblet cells), induce bronchoconstriction during viral infections by triggering smooth muscle contraction (50, 51). MCs also bridge communication between the immune and nervous systems (Fig. 1B) by producing neurotransmitters and other mediators, such as nerve growth factor, serotonin, substance P, and NO (52). In addition to inflammatory pain, MC-to-neuron communication likely contributes to processes, such as gut motility, that promote parasite expulsion (53, 54). Mediators that regulate vascular flow and permeability (e.g., histamine, proteases, leukotrienes) dominate early MC responses (14) (Fig. 1B). These mediators also facilitate the cellular recruitment from the circulation and into infection sites, in part, due to the upregulation of adhesion molecules on vascular endothelium. MC-derived TNF recruits neutrophils to sites of bacterial infection (55) and induces expression of E-selectin on blood vessels during cutaneous E. coli infection, which allows accumulation of multiple DC subsets within tissues (56). In contrast to the dominant recruitment of neutrophils during bacterial infection, MCs recruit unique cell types in response to other classes of pathogens (Fig. 1B), including eosinophils to sites of parasite infection and cytotoxic cells during viral infection (15, 57). MC products also promote the recruitment of basophils (58). CD8+ T cells and IFN-producing plasmacytoid DCs are recruited in response to TLR3 and TLR7 stimulation of MCs in vivo, respectively (34, 35). MCs also promote the accumulation of NK and NKT cells to the skin and DLNs during viral infection, thus enhancing viral clearance (15). In each of these examples, MCs promote chemotaxis of innate immune cells, at least in part through the production of chemokines. MC interaction with NK cells during inflammation may extend beyond their recruitment. For example, LPS or CpG-activated MCs physically interact with NK cells to promote enhanced IFN production that is contact- and TNF-dependent (59), suggesting that the physical interactions between MCs and NK cells that have been observed during viral infection within tissues (15) may be sites where this type of communication occurs. MCs need not only rely on recruited cells to clear pathogens, but they also produce compounds that have direct killing activity (60). AMPs are short-charged peptides that are thought to generate pores in microbial but not eukaryotic membranes. One AMP, cathelicidin, has direct killing activity against certain bacterial and viral pathogens. It is granule-associated and is also inducible in MCs (16, 60). Granule proteases, many of which are MC-specific, may also act in tissues to break down microbial virulence factors or toxins, similar to snake venom toxins, which can be neutralized by MC granules (61). MCs initiate proinflammatory cytokine production, but they also inhibit these responses when a situation warrants such action. This may serve multiple purposes: to restore homeostasis after pathogen clearance, prevent tissue damage due to prolonged inflammation, or to facilitate wound repair. Recent studies emphasize the role of MCs in maintaining peripheral tolerance or preventing excessive inflammation (62–64). During bladder infection, the initial proinflammatory response of MCs to E. coli is followed by production of traditionally immunosuppressive cytokines, including IL-10, promoting tolerance in the bladder (64). Because IL-10 also promotes certain aspects of tissue regeneration (65), it might facilitate postinfection healing. MCs are thought to reduce scarring during wound healing, as does IL-10 (65, 66). Whereas recent studies have suggested that IL-10 does not promote wound closure, and perhaps even delays the process (67), IL-10 is a mitogenic factor for MC progenitors (68). MCs also produce TGF-β, which suppresses the function of Mϕs and DCs in vivo (64, 69). For Mϕs, TGF-β reduces the TLR-activated transcription of cytokines such as TNF and CCL3 and reduces NO production by preventing expression of iNOS (70), likely another mechanism by which MC-derived TGF-β acts in a tissue as an infection clears. These studies illustrate that the sentinel function of MCs is followed by a key role in the regulated resolution of inflammation. MC-directed responses may also promote immunity in one context while having a suppressive function in another. In one study, it was observed that MC interactions with monocytic myeloid-derived suppressor cells suppressed antitumor immunity whereas MC interactions with granulocytic myeloid-derived suppressor cells enhanced clearance of parasites (71). Thus, MCs may have widely divergent proinflammatory or immunosuppressive effects depending on the cell types that they recruit to, or encounter within, an inflammatory milieu. MC-mediated innate immunity usually promotes timely resolution of acute infection, but the role of MCs is markedly more complex in chronic infections. During lung mycobacterial infections, MC regulation of the local cytokine milieu encourages the development of granulomas, which, paradoxically, both contain bacterial spread and protect bacteria from total clearance (72). MCs may also promote chronic infections and exacerbate associated pathologies depending on the pathogen species and load, the site of infection, or any pre-existing inflammatory disease. Examples include staphylococcal infections in atopic dermatitis, Pseudomonas aeruginosa infections of inflamed cystic fibrotic lungs, and Helicobacter pylori infections in chronic gastritis (73–75). MCs exacerbate inflammation through hypersecretion of mediators such as IL-1α and IL-1β (74) or by anomalous recruitment of cytotoxic cells, for example, neutrophils and eosinophils. Recently, MC-derived IL-1β and TNF were reported to contribute to indigenous microbiota-induced skin disease in neonatal mice, and a mechanism involving aberrant NLRP3 inflammasome signaling was implicated, with MC hyperplasia further amplifying pathology (75). MCs can actively proliferate at sites of chronic inflammation, such as in the gut mucosae during parasite infection (17). It is assumed that immature or newly recruited MCs constitute the proliferative subset in tissues, but further studies are needed to address which subsets of MCs can proliferate in tissues and how their maturation and activation levels influence cell cycle regulation. MCs also can undergo multiple cycles of prestored or de novo–synthesized mediator release (5). Between cycles of degranulation there may be a refractory period due to depletion of intracellular granule stores or desensitization to repeated Ag challenges (76). Harmful effects of MCs are more likely when the pathogen load is high and widespread, such as during bacterial sepsis. The location of MCs near the vasculature where their mediators can rapidly gain access into blood vessels probably contributes to pathology (14). A functional comparison of systemic versus regional MC responses during bacterial infection has emphasized that MCs mediate both beneficial and harmful host responses (77). Although prompt and localized MC activation during infection usually is beneficial, systemic and sustained MC activation, typically associated with chronic or severe systemic infections, may not be. The immunoregulatory capacity of MCs may also be relevant to vaccine design and immunization. For example, mucosally or s.c. delivered MC activators can enhance immunity to vaccine Ags (78). MC activators promote recruitment of cells, including APCs, to vaccination sites without signs of toxicity (78). Enhanced Ag-specific immunity was induced when vaccines were coadministered with synthetic MC granules, being nanoparticles comprised of a carbohydrate scaffold loaded with cytokines (19). Thus, by activating MCs or directly applying MC products during vaccination, it is possible to markedly boost immune responses to the accompanying Ag. It is conceivable that MC activators or simulators of MC granules could also be used therapeutically against infection. Therapeutic modulation of MCs has been explored in the context of suppressing unwanted inflammation, and TLR7 on MCs is a promising target. MCs are central to the mechanism of action of the TLR7-modulating drug imiquimod, and therapeutic administration of a weakly agonistic TLR7 ligand was shown to reduce MC-driven neutrophil influx during chemically induced colitis (34, 79). Another TLR7 agonist reduces allergic responses associated with rhinitis in humans, assumed to work by promoting a shift in the inflammatory profile of nasal MCs from Th2 to Th1 (80). In chronic infections or those that exacerbate pre-existing inflammatory conditions where MCs contribute to the associated pathology, MC stabilizers may be of benefit. For example, treatment of T. spiralis–infected rodents with the MC stabilizer ketotifen reduced MC hyperplasia and hypermotility of the gut, a motor disturbance similar to that observed in irritable bowel syndrome (81). MC stabilizers and antihistamines are used to treat asthma, including episodes precipitated by viral infections (82). MCs evolutionarily predate most cells of the immune system, including the adaptive immune system (83). Consequently, they possess broad and overarching functions that integrate at many levels with immune processes that arose later during vertebrate evolution. Utilizing the canonical innate immune pathways, they discriminate between self and non-self. When a pathogen-specific motif has been detected, they alert the host of an infection while directly mediating pathogen clearance. MCs possess a broad repertoire of receptors to detect infections: traditional PRRs, other receptors that directly sense pathogens, and receptors for endogenous danger signals released by infected and injured host cells. To some individual stimuli and nearly always in the context of true infection where multiple pathways are activated simultaneously, MCs release discrete nanoparticles within minutes that are loaded with proinflammatory mediators. By virtue of being tissue-resident and presynthesizing and storing mediators, MCs enhance the kinetics of the inflammatory response and can amplify the activation levels of neighboring immune cells. They can release a substantial amount of mediators whereas other innate immune cells are still only beginning to modify their transcriptional programs. The particulate form of an exocytosed granule prolongs the longevity of its cargo and also facilitates its transport to distal sites or uptake by phagocytic cell types that participate in the innate immune response (19). Degranulation is followed by regulated secretion of a pathogen-specialized panel of de novo–synthesized mediators. The preponderance of MCs at mucosal sites, in skin and near blood vessels, makes them uniquely capable of sensing early infection and colonization events. Their close physical association with blood vessels promotes leukocyte recruitment to infection sites and systemic dispersal of MC products. MCs also regulate the quality and magnitude of their responses depending on the pathogen, the stage of infection, and their location. These observations reveal temporally and spatially specific aspects to MC responses. Although the actions of MCs early in infection are thought to be mostly beneficial, they can have a detrimental impact during chronic or overwhelming infection. In these cases, and in certain disorders involving aberrant innate activation during sterile inflammation, the sensory and secretory properties of MCs become counterproductive or pathological. With the growing recognition of the critical role played in MCs in promoting beneficial innate responses during infections as well as in exacerbating infection and promoting pathologies, it may be possible to judiciously employ MC-modulating compounds for therapeutic effect. This work was supported by National Medical Research Council of Singapore Grant NIG/1053/2011, the Duke–National University of Singapore Signature Research Program funded by the Ministry of Health, Singapore, the Duke University/Duke–National University of Singapore Collaborative Initiative, and National Institutes of Health Grants U01-AI082107, R01-AI096305, and R56-DK095198.
. 2006. Intracellular pattern recognition receptors in the host response. Nature 442: 39–44.
. 2001. Induction of direct antimicrobial activity through mammalian Toll-like receptors. Science 291: 1544–1547.
. 2000. Transcriptional regulation of β-defensin gene expression in tracheal epithelial cells. Infect. Immun. 68: 113–119.
. 2010. Mast cell-orchestrated immunity to pathogens. Nat. Rev. Immunol. 10: 440–452.
. 2012. Extracellular ATP mediates mast cell-dependent intestinal inflammation through P2X7 purinoceptors. Nat. Commun. 3: 1034.
. 2006. Cooperative activation of TLR2 and bradykinin B2 receptor is required for induction of type 1 immunity in a mouse model of subcutaneous infection by Trypanosoma cruzi. J. Immunol. 177: 6325–6335.
. 2005. “Host tissue damage” signal ATP promotes non-directional migration and negatively regulates Toll-like receptor signaling in human monocytes. J. Biol. Chem. 280: 32459–32467.
. 2011. Myocardial ischemia activates an injurious innate immune signaling via cardiac heat shock protein 60 and Toll-like receptor 4. J. Biol. Chem. 286: 31308–31319.
. 2011. Toll-like receptor 4 (TLR4) is essential for Hsp70-like protein 1 (HSP70L1) to activate dendritic cells and induce Th1 response. J. Biol. Chem. 286: 30393–30400. 1986. The membrane attack complex of complement. Annu. Rev. Immunol. 4: 503–528.
. 2011. Modulation of inflammasome pathways by bacterial and viral pathogens. J. Immunol. 187: 597–602.
. 2011. Mast cell modulation of the vascular and lymphatic endothelium. Blood 118: 5383–5393.
. 2011. Immune surveillance by mast cells during dengue infection promotes natural killer (NK) and NKT-cell recruitment and viral clearance. Proc. Natl. Acad. Sci. USA 108: 9190–9195.
. 2012. Skin mast cells protect mice against vaccinia virus by triggering mast cell receptor S1PR2 and releasing antimicrobial peptides. J. Immunol. 188: 345–357.
. 1984. Mucosal mast cells are functionally active during spontaneous expulsion of intestinal nematode infections in rat. Nature 312: 450–452.
. 2009. Mast cell-derived particles deliver peripheral signals to remote lymph nodes. J. Exp. Med. 206: 2455–2467.
. 2012. Synthetic mast-cell granules as adjuvants to promote and polarize immunity in lymph nodes. Nat. Mater. 11: 250–257.
. 1956. Fate of shed mast cell granules. Proc. Soc. Exp. Biol. Med. 92: 256–261.
. 2010. Substance P primes lipoteichoic acid- and Pam3CysSerLys4-mediated activation of human mast cells by up-regulating Toll-like receptor 2. Immunology 131: 220–230.
. 2003. Cutting edge: distinct Toll-like receptor 2 activators selectively induce different classes of mediator production from human mast cells. J. Immunol. 170: 1625–1629.
. 2004. Activation of mast cells by double-stranded RNA: evidence for activation through Toll-like receptor 3. J. Allergy Clin. Immunol. 114: 174–182.
. 2007. Mast cells play a crucial role in Staphylococcus aureus peptidoglycan-induced diarrhea. Am. J. Pathol. 171: 537–547.
. 2002. Differential responses of mast cell Toll-like receptors 2 and 4 in allergy and innate immunity. J. Clin. Invest. 109: 1351–1359.
. 2012. FcεR1-mediated mast cell reactivity is amplified through prolonged Toll-like receptor-ligand treatment. PLoS ONE 7: e43547.
. 2002. Lipopolysaccharide-dependent prostaglandin E2 production is regulated by the glutathione-dependent prostaglandin E2 synthase gene induced by the Toll-like receptor 4/MyD88/NF-IL6 pathway. J. Immunol. 168: 5811–5816.
. 2004. Activation of airway epithelial cells by Toll-like receptor agonists. Am. J. Respir. Cell Mol. Biol. 31: 358–364.
. 2005. Characterization of Toll-like receptors in primary lung epithelial cells: strong impact of the TLR3 ligand poly(I:C) on the regulation of Toll-like receptors, adaptor proteins and inflammatory response. J. Inflamm. (Lond.) 2: 16.
. 2007. Mast cells are crucial for early inflammation, migration of Langerhans cells, and CTL responses following topical application of TLR7 ligand in mice. Blood 110: 946–953.
. 2009. Impaired mast cell-driven immune responses in mice lacking the transcription factor NFATc2. J. Immunol. 182: 6136–6142.
. 2012. Imiquimod clears tumors in mice independent of adaptive immunity by converting pDCs into tumor-killing effector cells. J. Clin. Invest. 122: 575–585.
. 2005. TLR3-induced activation of mast cells modulates CD8+ T-cell recruitment. Blood 106: 978–987.
. 2004. Signaling through Toll-like receptors triggers HIV-1 replication in latently infected mast cells. J. Immunol. 172: 4391–4401.
. 2012. Inflammasomes in health and disease. Nature 481: 278–286.
. 2009. Mast cells mediate neutrophil recruitment and vascular leakage through the NLRP3 inflammasome in histamine-independent urticaria. J. Exp. Med. 206: 1037–1046.
. 1999. The mast cell tumor necrosis factor α response to FimH-expressing Escherichia coli is mediated by the glycosylphosphatidylinositol-anchored molecule CD48. Proc. Natl. Acad. Sci. USA 96: 8110–8115.
. 2001. Co-option of endocytic functions of cellular caveolae by pathogens. Immunology 102: 2–7.
. 1998. Direct evidence of mast cell involvement in Clostridium difficile toxin A-induced enteritis in mice. Gastroenterology 114: 956–964.
. 2001. Interaction of Bordetella pertussis with mast cells, modulation of cytokine secretion by pertussis toxin. Cell. Microbiol. 3: 181–188.
. 1996. Cholera toxin increases IL-6 synthesis and decreases TNF-α production by rat peritoneal mast cells. J. Immunol. 156: 316–321.
. 2012. New models for analyzing mast cell functions in vivo. Trends Immunol. 33: 613–625.
. 2010. Mast cells elicit proinflammatory but not type I interferon responses upon activation of TLRs by bacteria. Proc. Natl. Acad. Sci. USA 107: 8748–8753. 1989. Heterogeneity of mast cells and phenotypic change between subpopulations. Annu. Rev. Immunol. 7: 59–76.
. 2012. Susceptibility and immunity to helminth parasites. Curr. Opin. Immunol. 24: 459–466.
. 1983. Immunity to intestinal parasites: role of mast cells and goblet cells. Fed. Proc. 42: 1750–1755.
. 1997. Histamine H2 receptor-mediated airway goblet cell secretion and its modulation by histamine-degrading enzymes. J. Allergy Clin. Immunol. 99: 233–238.
. 1990. Leukotriene D4 (LTD4) induces mucus secretion from goblet cells in the guinea pig respiratory epithelium. Exp. Lung Res. 16: 711–725. 2007. Mast cell regulation of airway smooth muscle function in asthma. Eur. Respir. J. 29: 827–830.
. 2007. Differential release of mast cell mediators and the pathogenesis of inflammation. Immunol. Rev. 217: 65–78.
. 1987. Intestinal mucosal mast cells in normal and nematode-infected rat intestines are in intimate contact with peptidergic nerves. Proc. Natl. Acad. Sci. USA 84: 2975–2979.
. 1994. Neuroimmune communication in the submucous plexus of guinea pig colon after infection with Trichinella spiralis. Gastroenterology 107: 1602–1609.
. 1996. Mast cell modulation of neutrophil influx and bacterial clearance at sites of infection through TNF-α. Nature 381: 77–80.
. 2009. Mast cells augment adaptive immunity by orchestrating dendritic cell trafficking through infected tissues. Cell Host Microbe 6: 331–342.
. 2008. Mouse mast cell tryptase mMCP-6 is a critical link between adaptive and innate immunity in the chronic phase of Trichinella spiralis infection. J. Immunol. 180: 4885–4891.
. 2000. Roles of mast cells and basophils in innate and acquired immunity. Curr. Opin. Immunol. 12: 624–631.
. 2010. Lipopolysaccharide-mediated mast cell activation induces IFN-γ secretion by NK cells. J. Immunol. 185: 119–125.
. 2003. Cutting edge: mast cell antimicrobial activity is mediated by expression of cathelicidin antimicrobial peptide. J. Immunol. 170: 2274–2278.
. 2006. Mast cells can enhance resistance to snake and honeybee venoms. Science 313: 526–530.
. 2012. Tryptophan hydroxylase-1 regulates immune tolerance and inflammation. J. Exp. Med. 209: 2127–2135.
. 2007. Mast cell-derived interleukin 10 limits skin pathology in contact dermatitis and chronic irradiation with ultraviolet B. Nat. Immunol. 8: 1095–1104.
. 2013. Mast cell interleukin-10 drives localized tolerance in chronic bladder infection. Immunity 38: 349–359.
. 2008. IL-10 overexpression decreases inflammatory mediators and promotes regenerative healing in an adult model of scar formation. J. Invest. Dermatol. 128: 1852–1860. 2008. Immune cells in the healing skin wound: influential players at each stage of repair. Pharmacol. Res. 58: 112–116.
. 2007. Accelerated wound closure in mice deficient for interleukin-10. Am. J. Pathol. 170: 188–202.
. 2003. IL-10, an inflammatory/inhibitory cytokine, but not always. Immunol. Lett. 86: 123–129.
. 2001. Activation of paracrine TGF-β1 signaling upon stimulation and degranulation of rat serosal mast cells: a novel function for chymase. FASEB J. 15: 1377–1388.
. 2012. Cutting edge: mast cells critically augment myeloid-derived suppressor cell activity. J. Immunol. 189: 511–515.
. 2012. Mycobacterium tuberculosis: success through dormancy. FEMS Microbiol. Rev. 36: 514–532. 2009. The role of leukocytes, keratinocytes, and allergen-specific IgE in the development of atopic dermatitis. J. Invest. Dermatol. 129: 1878–1891.
. 2002. Pseudomonas aeruginosa activates human mast cells to induce neutrophil transendothelial migration via mast cell-derived IL-1 α and β. J. Immunol. 169: 4522–4530.
. 2012. Critical role for mast cells in interleukin-1β-driven skin inflammation associated with an activating mutation in the nlrp3 protein. Immunity 37: 85–95.
. 2012. In vitro desensitization of human skin mast cells. J. Clin. Immunol. 32: 150–160.
. 2011. Systemic mast cell degranulation increases mortality during polymicrobial septic peritonitis in mice. J. Leukoc. Biol. 90: 591–597.
. 2008. Mast cell activators: a new class of highly effective vaccine adjuvants. Nat. Med. 14: 536–541.
. 2012. Mast cell-mediated inhibition of abdominal neutrophil inflammation by a PEGylated TLR7 ligand. Mediators Inflamm. 2012: 262394.
. 2012. Repeated intranasal TLR7 stimulation reduces allergen responsiveness in allergic rhinitis. Respir. Res. 13: 53.
. 2006. Mast cell stabilizer ketotifen [4-(1-methyl-4-piperidylidene)-4H-benzo[4,5]cyclohepta[1,2-b]thiophen-10(9H)-one fumarate] prevents mucosal mast cell hyperplasia and intestinal dysmotility in experimental Trichinella spiralis inflammation in the rat. J. Pharmacol. Exp. Ther. 319: 1104–1111.
. 2003. Long-term management of asthma. Indian J. Pediatr. 70: 63–72.
. 2002. Colocalization of heparin and histamine in the intracellular granules of test cells from the invertebrate Styela plicata (Chordata-Tunicata). J. Struct. Biol. 137: 313–321.